The third day of the festival and the beast from the east was closing in on us fast. Herbie had taken a measured decision that today would be our final day as the weather forecast for tomorrow could see us snowed in at Stafford Moor. Now we had plenty of beer and food to last but it was definitely the right decision given the conditions. After all we still had curry night to enjoy too. Today I'd be on Tanners and was really hoping for a draw on the lawns, not too far from the comfort of the lodge. Again the lakes had frozen lids on them so it was going to be a tough one. Peg 17 on Tanner would be my home for the day. This is directly opposite the lodge, not quite next to it as I'd hoped. I'd have Rob A and Silvers for company. Pete Bailey had drawn 18 and once he saw the lake he quite rightly said he was off home! 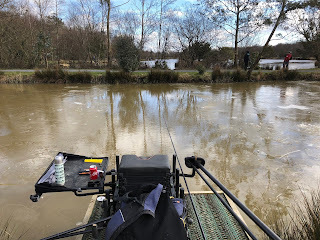 We were greeted to the second day with ice on the lakes and a very cold easterly wind. 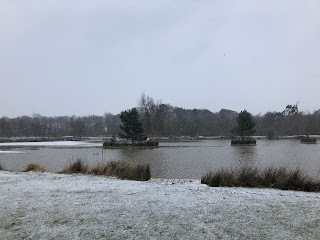 The beast from the east was heading our way that was for sure. Animal was heading down for the night and he was cooking for us too, bonus! Yesterday was a tough day for all with Captain and Col Merce leading the festival so far. Today it was our turn for Pines that mostly had a thick ice lid on top of it! Negative feeding would be the order of the day. I was also up against Big Nige in today's knock out. Well at least I'm not on Woodpeckers! Peg 3 would be my home for the day however before I could even set up it was time to break out the ice breaker. Luckily Peg 3 I was able to access from both banks so could break the ice across the lake. It took an hour of effort however I was rewarded with a lovely clear wide channel to fish. My neighbour was John Nugent one of the new ASBO's. Day 1 of the festival and a great night in the Lodge of Plenty with spirits high even though the weather wasn't looking it's best and set to get worse! Everyone gathered at the Tackle shop, Kenfish doing a great job of collecting the pools money and organising the rabble, then it was our leaders turn, Herbie. But of course before he could speak a rousing welcome of, "Herbie is our leader, la, la, la, la" was sung in his honour. Please not Woodpecker was my thought having spent two very fruitless days on there already. The peg came out of the bag, it was red which meant Woodpecker again! This time I'd be again on the high back although peg 17 in the corner which was a bit more sheltered from the wind. Neighbours for the day, Chris Martin and Pete Bailey. I mentioned to Pete I don't mind seeing him, but not on the next peg! At least I could observe his angling approach I thought to myself. The previous night those already at the fishery went to the Lymington Arms for a beef dinner with Jo and Paul and the draw for teams. Herbie had sacked last years captains and new captains assigned, you can imagine my surprise when my name came out to be a team captain. I drew from the 4 pint pots and drew Shedders, Pete Merce, Pat Pritchard and Hainsey, what a team! The day when the rest of the lads would descend on the fishery and the chance to have a Champions League match with all three lakes in the draw. I had popped out early in the morning to grab some more cash and toast for the lads. 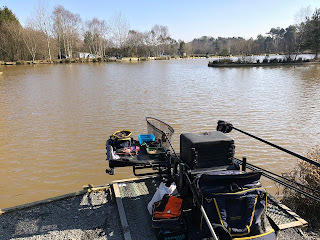 It was an early start and I managed to get back to the fishery before 8am, however my "entry speed" into the fishery had been captured on CCTV together with the large cloud of dust I'd created. By the time I would get to the draw I'd been identified by Herbie as the culprit and was in for a surprise fine! That time of year is on us once again, time to drive down to Devon and the brilliant Stafford Moor fishery to see Paul and Jo and witness the work they've untaken since last years trip. We would not be disappointed. An early morning start saw me getting to the fishery at 9am to be welcomed with a hug, from Jo, not Paul and a cup of coffee. 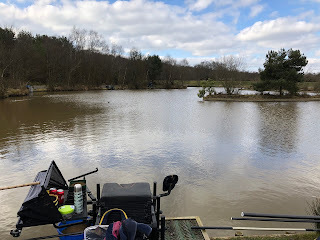 Behind the tackle shop the new lake is taking shape, the roads around the fishery vastly improved together with plenty of great parking at the lodges. Paul and Jo have also built an area with electrical hook ups for caravan and motorhome owners. Great job guys! I was first at the lodge so plenty of time to unpack both the fishing gear, clean the worms, prepare some ground bait and get the food and beer supplies ready. 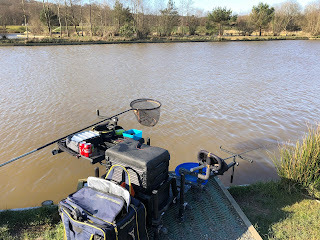 Today, Herbie had organised a knock up match for 3 hours which allows you to get your gear sorted for the week and also to figure out where it all is after the winter storage.